The Arizona Cardinals have placed running back Adrian Peterson on injured reserve, according to ESPN’s Adam Schefter. Peterson has been dealing with a neck injury over the last few weeks, and will now miss the remainder of the season. Peterson spent the first four weeks of the season with the New Orleans Saints, but he struggled to see significant playing time. In his four games with the Saints, he managed just 17.0 percent of the team’s offensive snaps. He ended those weeks with a PFF overall grade of just 49.5, which ranked 61st of 81 backs with at least 25 snaps in that span. He was then traded to the Arizona Cardinals and was immediately thrust to the top of the depth chart, which led to an instant uptick in his workload. In Weeks 6 through 12, he ran the ball 129 times (second most among backs in that span) for 448 yards, with his best performance coming Week 9, where he ran the ball 37 times for 159 yards, 110 yards after contact, and forced a total of seven missed tackles. 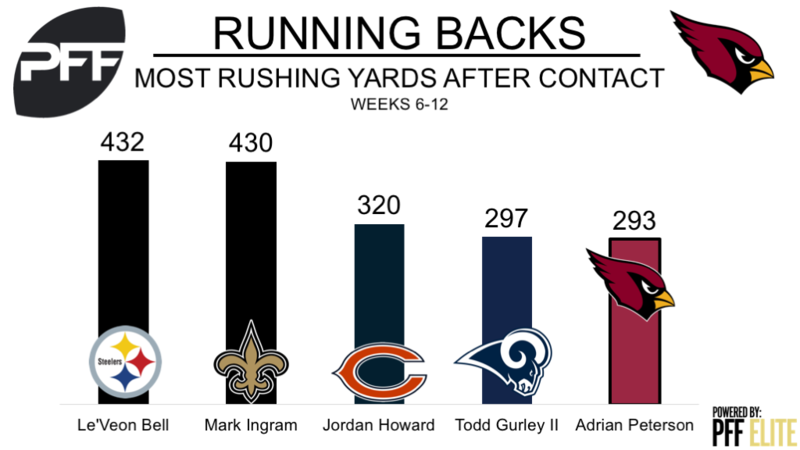 In Peterson’s time with the Cardinals, he was hit in the backfield 37 times (the most among running backs in that span), yet he managed to produce positive yardage on 23 of those carries, and all told, he gained 293 rushing yards after contact and forced 19 tackles on his rushing attempts, which ranks fifth and second among running backs in that span, respectively, which proves that Peterson can still very much produce at the NFL level going forward.